Lock in a great price for Noufaro – rated 8.4 by recent guests! We loved that the property was just by the beach, just had to cross the street. Also, the property looked very nice from the outside. The personel was welcoming. Amazing location. Staff were helpful and friendly with a beautiful pool area. The location was great. right next to the beach and restaurants and the owners were so lovely and welcoming. The staff probably made my stay that much better. Hotel in front of Mylopotas beach, very close to restaurants, market and bakery places, nice swimming pool area, bar for drinks and snacks and stuff very helpfull and nice. Absolutely amazing location, practically on the beach. The pool was lovely too. Very clean and the rooms were just perfect. Building is typically Greek style and just a pleasure to stay in. Excellent poolarea. Close to the beach and the local bus stop just outside the door. Really good poolarea. Nice and clean. Excellent location just two steps away from the Mylopotas Beach and a busstop just straight outside the entrance. Located right on the sandy beach of Mylopotas in Ios, Noufaro features a fragrant courtyard with stone-paved alleys, a swimming pool with hydromassage jets and pool bar. Its air-conditioned accommodations comes with free Wi-Fi and a private balcony overlooking the garden or the mountain. Simply decorated with wooden furnishings and soft colors, the rooms of Noufaro have a fridge and a safe. Each unit is features a TV with satellite channels and a radio. The private bathroom comes with a shower and a hairdryer. 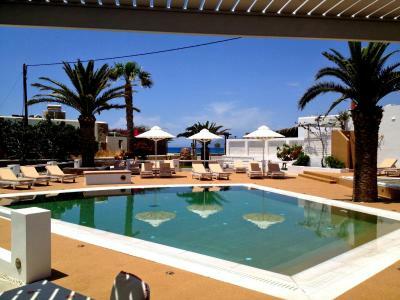 Guests will find restaurants, bars and mini markets within a short walk from Noufaro. The capital of Ios is at 1.9 mi, while Ios Port is 2.8 mi away. Car rental services are provided. Free public parking can be found on site. When would you like to stay at Noufaro? Overlooking the garden or the mountain from its balcony, this air-conditioned room features a fridge, a TV with satellite channels and free Wi-Fi. House Rules Noufaro takes special requests – add in the next step! Noufaro accepts these cards and reserves the right to temporarily hold an amount prior to arrival. 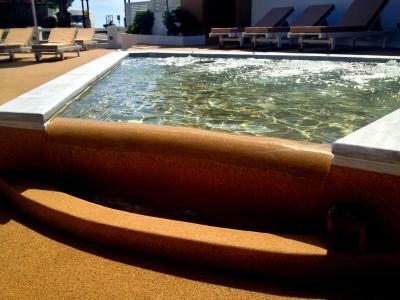 Please note that the special hydromassage area in the pool can also function as a children's pool. Well, there were a lot of things that almost ruined our vacation. Amongst them: -you could hear everything through the door and walls, being very hard to sleep at night. We could hear the voices of people talking, tv and the pipes from the bathroom -the bathroom utilities were deplorable. I think they were not cleaned properly through time and never repaired or changed. Limestone deposits everywhere, even on the curtain. We had a hard time taking a bath with all the mess around -we had a balcony to our room, the view was on the back of the house where there was a big land. In the morning the sun would shine there and it was very hot to stay and in the evening there were a lot of bugs. Therefore the balcony was useless, we couldn’t even leave the window open. -the fridge made a lot of noise and did not work quite well. Even though leaving beverages in it all day, they were not cold. I highly suggest being carefull what room you choose. We had a twin room in the last property building. The pictures on booking are only from the front buildings which have a higher price and look a little nicer. We would have liked a double bed. There were 2 beds put together but it was a gap between them. The bathroom needs a little more care. The shower curtain needs to be changed and the sink and shower batteries need more cleaning. It would have been great if we had a mosquito net. Also, we had only one nightstand near our bed so we had to improvise for the other one. The clothes drier on the balcony needs a repainting Also, note that the pictures on Booking are from a different hotel situated in the same place and owned by the same owner as Noufaro . Noisy, younger guests. We were woken up between 1-4am on four of the seven nights we stayed. we had to pay for the transfers to the port, never happened with any hotel in Greece before... The pool is shared with an other hotel, but there are not many people so it was ok. The rooms are basic for the price. the wifi in my room was not working fine, just outside and common areas, the ac was not working properly, dripping water mostly of the times. Super friendly staff, a bar by the pool, beach is across the road and bars and restaurants super close by ! Shower was basic but plenty of hot water. Room basic but clean. Fab location really close to beach. Pool area good and staff friendly and helpful. Great value for the price. Staff are very un pleasant. Pool area is very nice.